Special Containment Procedures: SCP-806 is to be kept sealed in Containment Locker 8 at Bio-Site-66. Researchers interested in utilizing the item are to contact Dr. Bridge for an interview. SCP-806-1-a has been given a standard humanoid containment suite at Bio Site-66. SCP-806-1-a is permitted Level-0 clearance, if supervised by at least one (1) Level-1 personnel at all times. SCP-806-1 may only be created upon explicit written approval by both Dr Bridge and Dr Seidelman of Site-66, or O-5 approval. 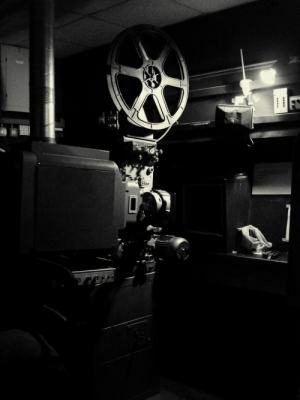 Description: SCP-806 is a large, modified film projector, originally built circa 1900. The item’s lens has been replaced with one constructed of several dozen thin layers of shaved precious stones and as of yet unidentified materials. The original projection bulb has been replaced by an LED array. Originally built for 35mm film, most inner mechanisms have been retrofitted with similar components of various complex alloys. These modifications also allow for most film sizes to be played. Additional mechanisms have been installed, allowing for multiple spools of film to be played through the item without interruption. Matter produced through this effect appears to first manifest as needle-thin rays of light projected from the lens. It creates no shadow or effect on the films being played, and appears to become biological matter at the point that it touches the forming human subject. “Copies” created this way are henceforth SCP-806-1. In order to produce SCP-806-1, film reels containing recordings of the deceased must be projected onto a silver lenticular cinema screen. Between 13 and 27 hours of recording is required to recreate the subject. At least one individual must be viewing the film through the duration of the phenomenon, or formation will cease and gradually reverse. Finalized instances of SCP-806-1 lack any colour pigment, as if in monochrome. This effect is independent of the colorization of the original source material. Tissue removed from instances will gradually gain colour pigment through unknown processes, but decay unusually rapidly and do not survive transplantation. Complete instances of SCP-806-1 usually retain most memories of their past life, and initially will believe that they are the original individual. All instances save for SCP-806-1-a die of cardiac arrest between 70 and 75 hours after final formation. Use of SCP-806 as a means of investigating film based anomalies, is pending review. 806-1-a and Discovery: SCP-806-1-a is the first known subject recreated through SCP-806, and the only still-surviving individual. 806-a is a young woman of indeterminate heritage appearing in her early 20s, apparently born in the early to mid 20th century. For an as of yet unknown reason, SCP-806-1-a appears to be afflicted by a form of dissociative amnesia which prevents her from recalling any personal information regarding her original life, including her own name. No records have yet been found regarding a person of 806-1-a's appearance or general timeline. 806-1-a was recovered alongside SCP-806 during its initial recovery. Agent Fishe, imbedded in the local police force, was investigating a call that youths had broken into a local theatre which had been closed for holidays. There the agent encountered an unknown male angrily shouting while attempting to gather up SCP-806 and other paraphernalia, and 806-1-a in a state of confusion and distress. The unknown male escaped Agent Fishe and civilian personnel. MTF Alpha-4 (“Pony Express”) was called to recover SCP-806, SCP-806-1-a, and approximately 50 hours of various types of film. The film contained 5.8 seconds of SCP-806-a laughing and saying “I love you”, repeating in various states of quality and colouration. 1. Note that fictional characters depicted are not restored; only the actor of that character will be recreated. 2. The target appears random, favouring whichever figure has the most on-screen time. 3. Cartoon films have no effect within SCP-806. 4. Two tests wherein the process was intentionally interrupted at the 19 th hour led to ‘unfinished’ physical bodies collapsing onto the floor; the more-formed instance succumbed to brain death, where the less complete instance simply died.